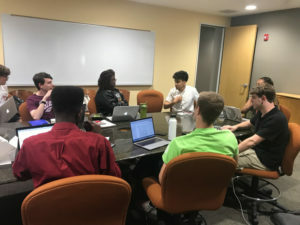 Procedural confusion filled Room 209 of the Nitery on Tuesday night as the 20th Undergraduate Senate debated whether to confirm two nominees to the University Building Naming Committee. Senators ultimately rejected two students appointed to the committee, assembled by President Marc Tessier-Lavigne in order to apply previously-chosen principles of renaming campus landmarks christened after Junipero Serra, the 18th-century missionary scrutinized for harming and reducing Native peoples. The discussion quickly grew as politicized as it was bureaucratic. Several senators, including Tyra Nicolay ’21, argued that Native representation is crucial to University discussions on renaming, and that the Senate should not confirm a set of nominees that do not provide that representation. But because Tessier-Lavigne has the authority to appoint members to the renaming committee, the Senate has no real power to remove anyone from their position in the group, according to Paul Brest, the committee chair and former dean of Stanford Law. “The decision to rescind the nomination simply doesn’t comport with…the University’s procedure,” Brest said. Nicolay alleged that in a private meeting with the president — which included other students but occurred before she became a senator — Tessier-Lavigne said that the renaming committees would include members of the Native community. “He promised that Native students would be involved in these conversations and would be active members in what was going on,” Nicolay said. Another meeting attendee, who is not a senator and who requested anonymity, said that she too had participated in similar discussions with Tessier-Lavigne and his staff. Carson Smith ’19, a former senator and an active member in the Native community, encouraged Stanford leaders to push for Native representation on the committee moving forward. “While I am frustrated that the Native American student community wasn’t represented in either of the past two committees despite the fact that this issue majorly impacts and was propelled by indigenous students, the next best step that the administration can take is thoroughly engaging with the Native community before releasing any final statements or decisions,” Smith said. Daniel Shevchuk ’21, a non-Native student who currently sits on the committee and who sought to be confirmed by the Senate on Tuesday night, defended his role in the renaming. “From my understanding, they wanted applicants who were unaffiliated and thus could take a more judicial approach to the issue at hand,” he said. Brest echoed a similar sentiment. “This is a committee designed to represent the various constituencies at Stanford — students, faculty, staff and alumni — but not to represent the stakeholders who are involved, because it’s supposed to make a judicial decision to apply [the devised] principles,” he said. Brest said that one nominated student was Native American, but she was not selected for the committee when she expressed her set belief on the renaming issue. Brest said that one Stanford alum, who is Native American, sits on the committee currently. Several senators — a few of whom shook their heads, and one of whom audibly muttered, “Jesus Christ!” as he spoke — seemed unconvinced by Shevchuk’s arguments. But ASSU Executive Shanta Katipamula ’19 said that Shevchuk and the other nominee, first-year medical student Brett Salazar, should not have been part of the bill in the first place; the two have already served on the renaming committee through the duration of this quarter. Further, according to Katipamula, Tessier-Lavigne wanted the committee to wrap up its work by the end of this academic year. She emphasized that only two weeks are left in the spring quarter; if the committee adheres to this timeline, stakeholders in the Native community don’t have much time to air their concerns before the group issues their final recommendations to the President. Brest confirmed that the committee’s outreach efforts — including a mix of town halls, forums and house visits — are ongoing. He said this outreach especially considers perspectives of Native and Catholic members of the Stanford community. The committee has yet to provide its final recommendations to the President, though they would like to conclude their work by the end of this academic term if possible. In its final meeting of the quarter, which extended 15 minutes beyond its allotted two hours, the body also confirmed the nomination of Jacob Randolph ’19 as the Elections Commissioner for the 2019 ASSU election cycle. Last spring, Randolph himself lost a Constitutional Council case after he alleged that he, rather than Lizzie Ford ’20, should fill a Senate seat left vacant due to an ASSU bylaw mandating that three students be upperclassmen. ASSU Executive Shanta Katipamula ’19 announced an open call for students to participate in interviews for the next Title IX coordinator, who will replace Cathy Glaze ’80 J.D. ’85 upon Glaze’s retirement. Students can indicate their interest in the process through Wednesday evening. Senators rejected a joint resolution on the General Use Permit and another bill that would have drastically reformed the ASSU Constitution— both of which were authored by Caleb Smith ’17 M.A. ’18. This article has been updated with comment from Paul Brest, former dean of Stanford Law and Renaming Committee chair.